Elizabeth J. West received her Ph.D. in English with a certificate in Women’s Studies from Emory University. Her teaching and scholarship focuses on spirituality and gender in early African American and Women’s Literature, and African Diasporic Literatures of the Atlantic World. She co-edits the Roman & Littlefield book series, Black Diasporic Worlds: Origins and Evolutions from New World Slaving. She is the author of African Spirituality in Black Women’s Fiction: (Lexington Books 2011), coeditor of Literary Expressions of African Spirituality (Lexington Books 2013). Her works can be found in critical anthologies and in journals such as MELUS, Amerikastudien, CLAJ, PALARA, JCCH, Womanist, Black Magnolias, and South Central Review. Her 2012 article, “From David Walker to President Obama: Tropes of the Founding Fathers in African American Discourses of Democracy, or the Legacy of Ishmael” was recognized among “Featured Articles” in American Studies Journals: A Directory of Worldwide Resources. 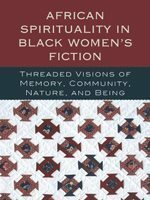 Her book African Spirituality in Black Women’s Fiction: Threaded Visions of Memory, Community, Nature and Being (Lexington Books 2011) is distinct in its employment of a diachronic lens to examine specific African spiritual sensibilities traceable from early to modern black women’s writings. Beginning with the poetry of Phillis Wheatley, this study traces applications and transformations of African spirituality in black women’s writings that culminate in the conscious and deliberate celebration of Africanity in Hurston’s Their Eyes Were Watching God. The journey from Phillis Wheatley’s veiled remembrances to Hurston’s explicit gaze of continental Africa represents the literary journey of black women writers to represent Africa as a creative and liberating resource. Along with receiving internal university support for her research and teaching, she is a former DAAD (Johannes Gütenberg University Mainz, Germany) and AAUW Fellow, and scholar in residence at Dartmouth College in the Department of AAAS. She was among scholars interviewed and consulted in the production of Georgia Public Broadcasting’s award winning documentary on the 75th anniversary of Margaret Mitchell’s Gone With the Wind. She is Treasurer of the College Language Association, Executive Director of the South Atlantic Modern Language Association, and serves on the Advisory Board of The Obama Institute for Transnational Studies. African Spirituality in Black Women’s Fiction: Threaded Visions of Memory, Community, Nature and Being. Lanham, MD: Lexington Books, 2011. Paperback edition, 2012. Among titles in “CHOICE e-Collection for African-American Studies,” http://www.publishersrow.com/Choice_African_American_Studies.htm. Envisioning Black Feminist Voodoo Aesthetics: African Spirituality in American Cinema. Kameelah Martin. Sept. 2016. Receptions of the Classics in the African Diaspora of the Hispanophone and Lusophone Worlds: Atlantis Otherwise. Eds. Elisa Rizo and Madeline M Henry. Sept. 2016. African Modernity and the Philosophy of Culture: The Works of Femi Euba. Iyunolu Osagie. Forthcoming. Jean Price-Mars, Haiti, and Africa: Between Two Worlds. Eds. Celucie Joseph et al. Forthcoming. Contributing Editor. “Religion and Spirituality” in Routledge Anthology of African American Rhetoric: Debates, Histories, Performances (forthcoming 2018). Gen. Eds. Vershawn Young and Michelle Bachelor Robinson. Co-ed. & Introduction. .Literary Expressions of African Spirituality. (Lexington Books 2013). Paperback edition, 2015. Reviewed in Caribbean Studies 41.2 (July – Dec 2013): 272 – 275; African Studies Quarterly 14.4 (September 2014): 102-103. Co-ed & Introduction. Five Decades of CLAJ on Race in Anglocentric Literary Works (Special Issue). CLAJ 57.3 (2014). Co-ed. & Introduction. Caribbean Women Writers in Exile. in Studies in the Literary Imagination 37.2 (Fall 2004). “We’ve Seen This Before: The Pre-Obama Transnational Figure in Early Black Atlantic Writings.” in Obama and Transnational American Studies Ed. Alfred Hornung. Heidelberg: Universitätsverlag Winter. 2016. “Blackness as Medium: Envisioning White Southern Womanhood in Eudora Welty’s ‘A Worn Path,’ and Delta Wedding and Kathryn Stockett’s The Help.” in From Uncle Tom’s Cabin to The Help: Critical Perspectives on White-Authored Narratives of Black Life. Eds. Claire Garcia and Vershawn Young. Palgrave-Macmillan. 2014. 39 – 56. “American Studies and the Racial Fault Line,'” Forum Response to Sebastian Weier’s “‘Consider Afro-Pessimism. '” Amerikastudien 59.3 (2014): 439 – 442. “Maps, Mythologies and Identities: Zombies and Contra-Anglo Spirituality in Edwidge Danticat’s Breath, Eyes, Memory and Angie Cruz’s Soledad.” PALARA (Publication of the Afro-Latin/American Research Association) 17 (Fall 2013): 1 -12. “The Enigmatic “Clear Black” in William Wells Brown’s Clotel,” CLA Journal 56.2 (December 2012): 170 – 183. “From David Walker to President Obama: Tropes of the Founding Fathers in African American Discourses of Democracy, or the Legacy of Ishmael.” 56 (2012) American Studies Journal (Center for American Studies, Harle-Wittenberg, Germany). “Memory, Ancestors, and Activism/Resistance in Charles Chesnutt’s Uncle Julius.” Studies in the Literary Imagination 43.2 (Fall 2010): 31-45. Reprinted in Short Story Criticism, Gale Literary Criticism Ser. 184. 2013. “Conflicting Epistemological Selves in the Narratives of Frederick Douglass.” CLA Journal. 52.1 (September 2008): 13-37. “Religion, Race, and Gender in the ‘Race-less’ Fiction of Alice Dunbar-Nelson.” Black Magnolias Literary Journal. 3.1 (March-May 2009): 5-19. “In the Beginning There Was Death: Spiritual Desolation and the Search for Self in Jamaica Kincaid’s Autobiography of My Mother.” South Central Review 20 (Summer-Winter 2003), 2-23. Reprinted in Jamaica Kincaid: Criticism and Interpretation. Ed. Harold Bloom. New York: Bloom’s Literary Criticism, 2008. 141-158. “Making the Awakening Hers: Phillis Wheatley and the Transposition of African Spirituality to Christian Religiosity.” in Cultural Sites of Critical Insight. Eds. Angela Cotten and Christa Davis Acampora. NY: SUNY Press, 2007. 47-66. “Cooper and Crummell: Dialogics of Race and Womanhood.” Representing Women Rhetors: Triumphs, Complications, and Misrepresentations. Eds. Hildy Miller & Lillian Bridwell-Bowles. Tuscaloosa: University of Alabama Press, 2005. 81-102. “Of Providence and Rhetoric: The Failure of Alexander Crummell’s Anglo-African Nationalism.” Slavery and Colonialism in the Atlantic World. Spec. issue of Journal of Colonialism and Colonial History 5.3 (2004). Project Muse. “Black Female Protagonists and the Abstruse Racialized Self in Antebellum African American Fiction.” Womanist Theory and Research. 3.2/4.1 (2001/20002): 50-56. “Reworking the Conversion Narrative: Race and Christianity in Our Nig.” MELUS 24 (Summer 1999), 3-27.